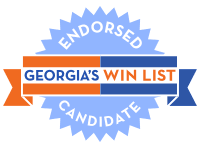 Georgia’s WIN List proudly endorses Dawn Randolph for Public Service Commissioner – District 5. With her 30 year career as a consumer-oriented public policy consultant, she knows her way around the Capitol, can cut through bureaucratic mazes and understands – possibly even enjoys – thick budget documents. An “Army Brat,” Dawn graduated from high school in Germany and received her undergraduate degree from The Pennsylvania State University before serving as an aide to Senator Sam Nunn in his Atlanta office. She worked full time for the American Heart Association and then the Georgia Department of Community Affairs while completing her master’s degree in Public Administration at Georgia State University. She has worked with statewide nonprofits and associations which promote consumer protection, access to health care, and open government. Dawn assists these organizations to maximize resources and train constituents to become more effective advocates on their own behalf. Her success includes working with legislators to secure funding for services for people with disabilities, mental health, and substance use disorder programs. Dawn is engaged as a volunteer with her sorority and other women’s organizations to provide workshops and mentorships to help young women build their leadership, understanding, and experience. Dawn has received advocacy awards and volunteer leadership recognition for her 30 years of service to young women and emerging leaders. She has been appointed by past Georgia Governors, both Democratic and Republican, to serve on commissions and task forces to improve community-based services. Request plans and proof that utility production and delivery systems are safe from computer hijacking by ensuring tough standards for cybersecurity. Pursue every avenue available to ensure renewable energy and emerging technologies can grow and thrive in Georgia. Put the PUBLIC back in the Public Service Commission by placing the consumer at the center of every decision. Work in the sunshine by making sure all sides are at the same table working together for a win-win solution. She will not accept campaign contributions from utility executives. Georgia women like Dawn are making history in this midterm election cycle as they run for seats long held by Republicans. With women in record numbers on the ballot this year, WIN List needs your help to elect these women and train the candidates we want to see on the ballot in 2020 and beyond.